New year in Rehoboth Beach, looking forward to what our local chefs are going to be bringing to many that visit our beaches and consider themselves foodies. There are plenty of us that live here year round and we love to check out our favorite places on this Second Season. 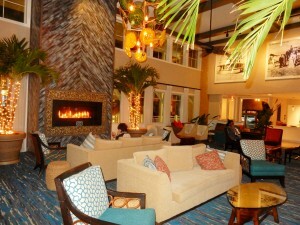 Rehoboth Beach, Delaware, is a year round resort. 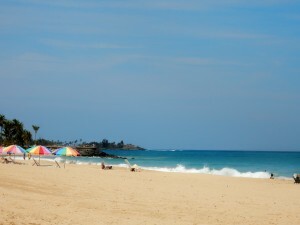 You can escape from major cities on the mid Atlantic and be here in just a couple of hours. The beach, the boardwalk are our playgrounds and I do not take it for granted. It was December 30th when Cindi and I stopped for a bite to eat. 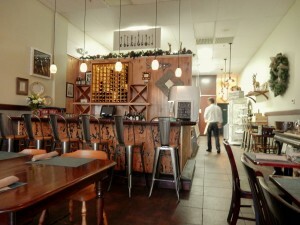 There is a Wine & Beer Bar and an open kitchen. 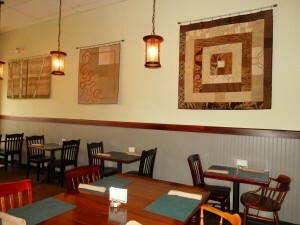 The dining room is spacious, comfortable and also very comfortable. 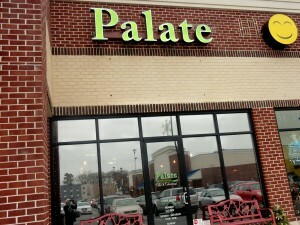 Palate is open Tuesday through Saturday from 11 a.m. until 9 p.m. Sunday from 9 a.m. to 1 p.m. Please check their Sunday menu because it is very good. One more choice in Rehoboth Beach to have breakfast on Sundays. When you live at the beach your house is usually a popular spot. 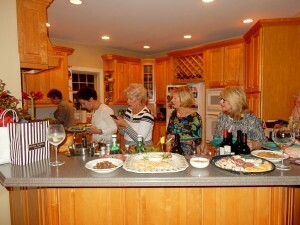 Don’t want to cook but want to show your guests like you have slaved all day long for them? 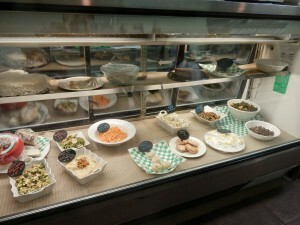 Palate has a Gourmet to Go station. 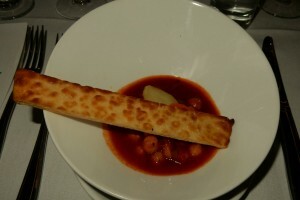 The menu changes frequently. But it is very easy to do. Just show up, make your selections and go home. 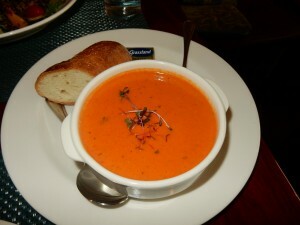 My butternut squash soup was creamy and perfect for the season. That was the soup of the day. 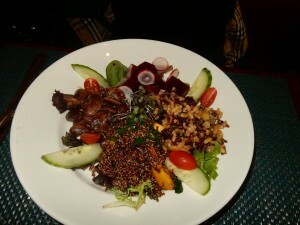 Cindi had the Grain Bowl with organic black Quinoa with lemon and mint, grilled sweet corn, grilled summer squash, pickled string beans and sprouts. Salmon Cake and Salad. A lighter meal very delicious and completely satisfying. No dessert….we were trying to be good. Our service was excellent and friendly. The prices were very reasonable. It was lunch but I shall be back for dinner soon. Talk to you later….have a good one. 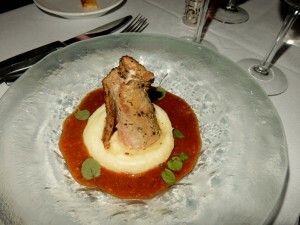 NOTE: Wine Dinner will be February 10th Call 302-249-8483 for reservations. $69 per person, plus gratuity. Check the Facebook Page for more info. You know, it really has not been bad at all. The weather here, in Rehoboth Beach, Delaware, has been perfect when you think of what winters we have had these past few years. But, now that it has gotten a bit colder I see that some of my friends are taking off for milder climates. I just thought that one place where you will have warm weather year round is Puerto Rico. 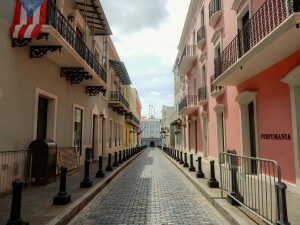 One of my favorites cities is Old San Juan. It is so romantic and a National Historic Landmark District. 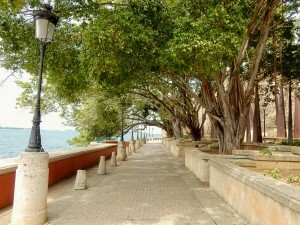 And one of my favorite walks is Paseo de La Princesa. 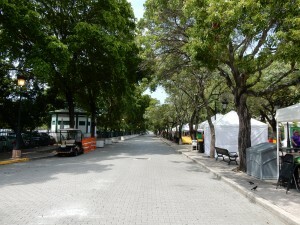 It is perfect for a power walk, or for just checking out the vendors that come during the week-ends to sell handmade Puerto Rican artifacts. Just follow the walk and you will see how beautiful it is. The group of sculptures is called Raices or Roots, and symbolizes the roots that gave birth to Puerto Rico cultural heritage. 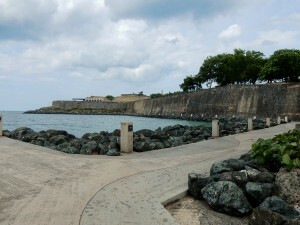 Continue walking, we are heading towards the San Juan Gate. 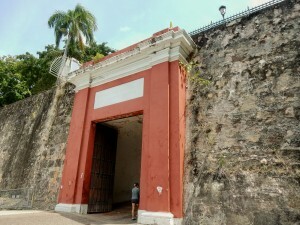 The San Juan Gate is named after Saint John the Baptist. 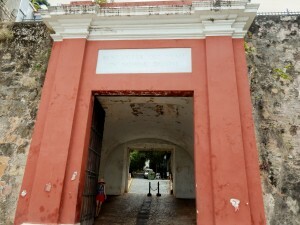 This gate was built in 1635 and it is the last remaining of San Juan’s principal gates. When I was younger you were able to drive through the Gate, but now is just walking. My cousin, Sonia, and I continued walking on a very hot day along the walled City. The wall was started in 1630 and finished in 1798. 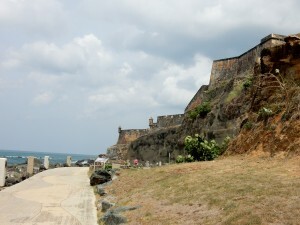 The wall was 3miles long and encircled the whole City of Old San Juan. 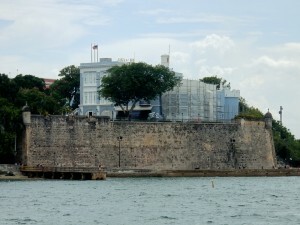 Preserving San Juan National Historic Site…helping to save the historic wall. There is a lot of erosion of wind, rain, and ocean waves. 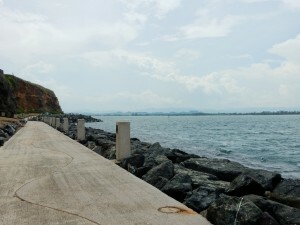 The riprap was finished in the 1990s, the concrete coating sprayed onto the slope is called shotcrete. 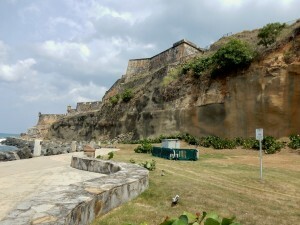 You can walk all the way to the back of El Morro Fort, and it is a great walk but remember that you will have to walk back. There is no way to access the other side of town at the end. I forgot to tell you to take some water with you. There is a water fountain at the end of the walk but the water is warm. 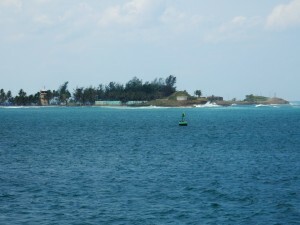 The small island across the channel is Isla de Cabra. 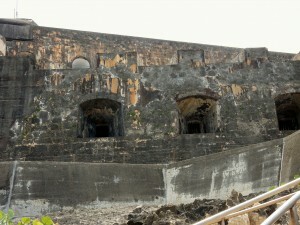 It is also the site of Fort San Juan de La Cruz, a vital link in San Juan’s defense system. Today it is a recreation area managed by the Commonwealth. 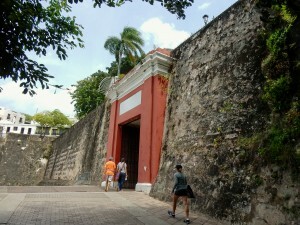 Entering the City through the San Juan Gate will be perfect to continue your walk through Old San Juan. 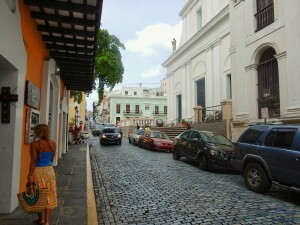 When walking through Old San Juan please wear comfortable shoes. The streets are most all cobblestones. The original blue cobblestones are there to see, but soon many of them will be replaced by new ones. 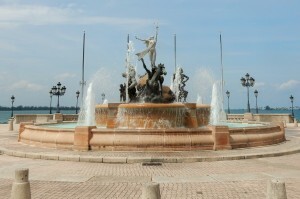 The original ones called in Spanish adoquines were cast from iron slag, which is the waste from iron smelting. 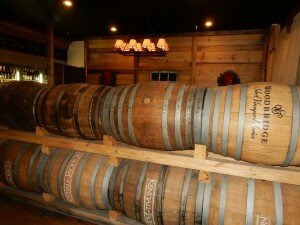 The first came to the island as ballast in the bottom of European merchant ships circa 1700s. 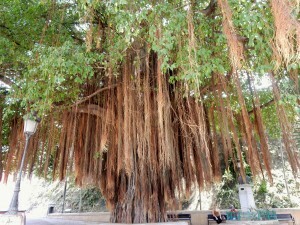 In Calle del Cristo you are sure to see original ones. 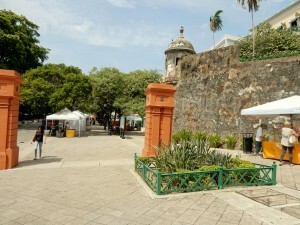 La Fortaleza is the official residence of the Governor of Puerto Rico in Old San Juan. On this photo is at the end of the street. 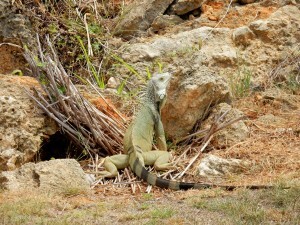 But if you are walking Paseo de La Princesa you can see it. When I was visiting, it was under renovation. With all the problems Puerto Rico has at the moments, financial and otherwise, it is still a beautiful island, worth exploring. 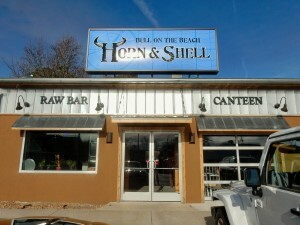 It just opened about one month ago, but already some of my friends are becoming habitual frequenters to this new place to eat in West Ocean Cit, Maryland at 12611 Ocean Gateway. It is right next to West O Bottle Shop. Tel. 410-213-7020. Website? http://www.hornandshelloc.com. It is a casual place. Come as you are. 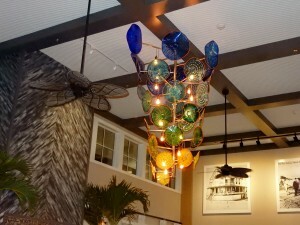 It is serving Small Plates, Crafted Signature Sandwiches, Daily Soups, Greens, Oyster Shooters…a Shell Bar!! Desserts!! 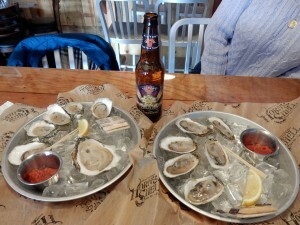 Arriving for a quick lunch, Cindi and I ordered oysters. Salty and cold!! 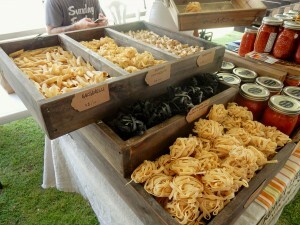 We decided to eat Tapas stye; choosing from their Shares & Tasters Small Plates. 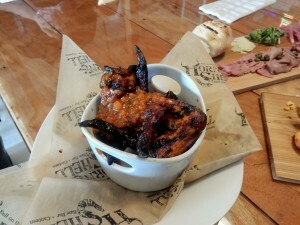 An order of Beer Brined Wings…Brined and grilled and then dunked in the fyer to finish. We wanted them well done! We chose the Mojito Glaze. 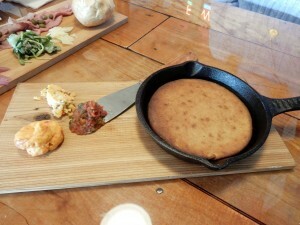 Black Skillet Corn Bread was dense, rich and warmed on the Pit. 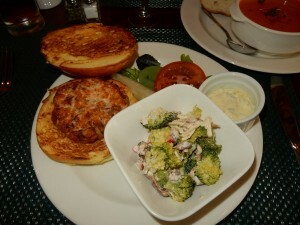 It was served with 3 housemade spreads on the side…savory butter, sun-dried tomato pesto, and cheddar cheese spread. Our third taster was K.H. 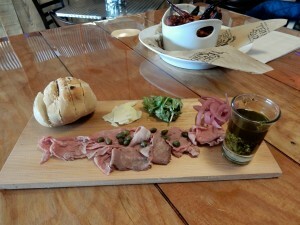 Beef Plank…Paper thin, super rare Pit Beef, pickled red onion, greens, shaved parmesan, chimichurri, and crisp bread. Thanks Nikki for your suggestions and for taking care of us so well. Growing up in Puerto Rico gave me an extra holiday to celebrate. This holiday celebrated in Spain and in Latin countries is called Three Kings Day. In Spanish it is Dia de Los Reyes. It’s celebrated on January 6th. Known as the Epiphany it is the Holiday celebrating the biblical adoration of the Baby Jesus by the Three Kings, or Wise Men…in Spanish Los Reyes Magos. Their names? Melchior, Caspar and Balthazar. They offered gold representing Jesus’ royal standing as King of the Jews. They also offered frankincense referring to His Divine nature. And, myrrh which was often used to embalm corpses. This was presented to the new baby as a symbol of Jesus’ mortality. So, when I was a young girl, I would go outside on the eve, which would have been January 5th, with a shoebox, and collect grass for the camels. I would place the box under my bed. Then, I would put cookies and milk for the Kings. In the morning I would find that the camels had made such a mess!! 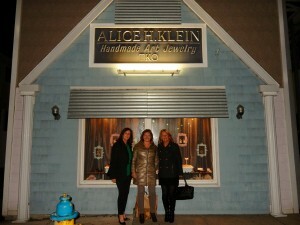 Once John and I had children and lived in Bethany Beach, I continued with this tradition. It really was a mess, but so worth it!! 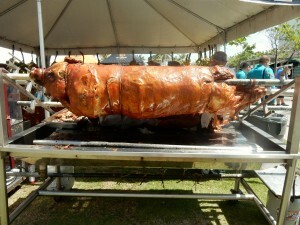 The tradition in Puerto Rico was to celebrate this day with roasting pigs, blood sausages, plantains, rice with green pigeon peas, flan and local music!! You still can find those parties but it is not like when I was growing up. 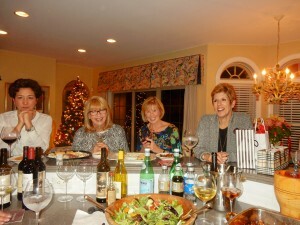 I invited friends for dinner on January 6th to celebrate Three Kings Day. I think this might become an annual tradition. 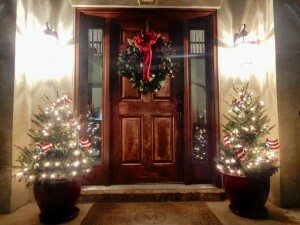 I got some Puerto Rican flags to put on the tree….forgot to get the group photo. I will be more organized next year, I promise. One of the typical drinks in Puerto Rico at this time of the year is Coquito. It is like an egg nog. 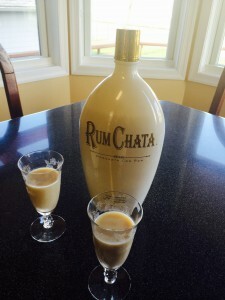 My brother told me that the Rum Chata would be perfect to serve. Guess what? I forgot to serve it, as well!! But, Cindi and I tried it the next day. Sooooo good!! I really thought I was very organized, but as my friends came and the chatting continued I almost forgot a few things that should have started cooking. Hey, don’t worry everything did come out pretty good. 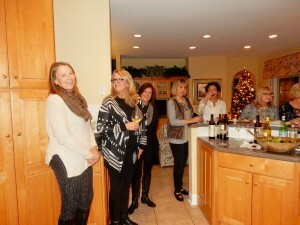 As usual we all gathered in the kitchen…that’s usually the case. A few appetizers…not too many because I had a lot of food. 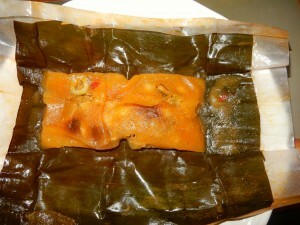 Pasteles are like tamales, but made with plantains. My brother had a Puerto Rican woman in Orlando, Florida, make them for me. Federal Express and here in no time. 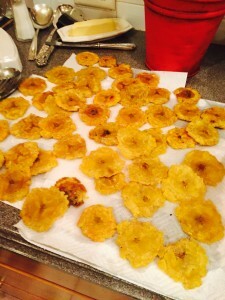 My grandmother used to make the best plantains but these were a second best. Inside they had raisins, olives, garbanzo beans, and chicken or pork. Fried plantains with mojito…I like the plantains thin. 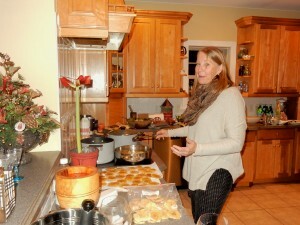 Here is Donna helping out in the kitchen. 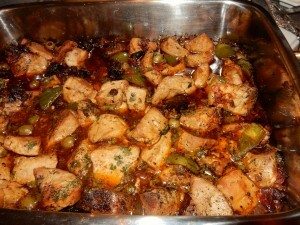 Pork loin chunks prepared with spices, cilantro, tamarind, olives, capers, and tomatoes. Cooked for some time letting the spices do their thing. 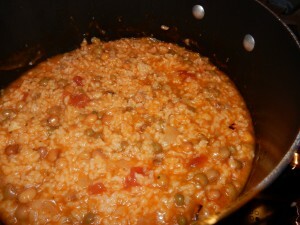 The rice with green pigeon peas was cooking but to tell you the truth I did not like the consistency. 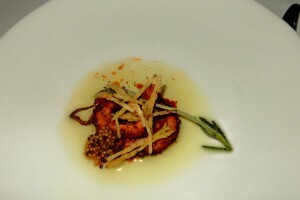 The taste was good, nevertheless. 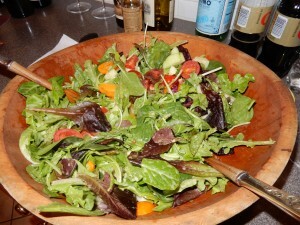 A green salad to clean our palate. For dessert 2 flans were made. 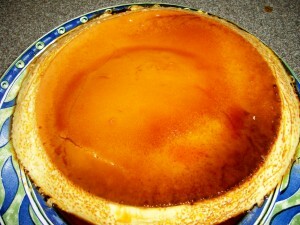 One a traditional Puerto Rican flan with milk and eggs. 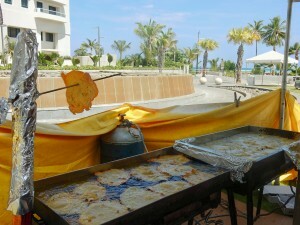 The other also widely made with cream of coconut….Guess what? I forgot to take the photo but here is a photo of one that I had made some time ago. No kidding, I will have to be better next time. That’s what happens when you are a too relaxed hostess!! 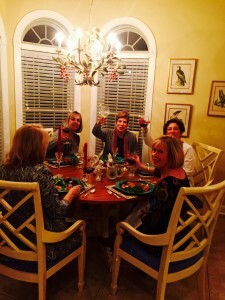 Two tables with the sounds of laughter and story telling, celebrating long time friendships!! It is always amazing!! 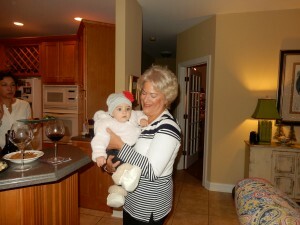 And my new granddaughter, Sophia, experienced her first Puerto Rican Fiesta!! Note: And if you thought you were finished with the Holidays, think again. 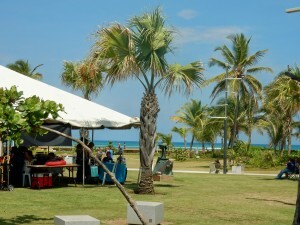 In Puerto Rico beginning on January 7th….8 more days of parties…called the Octavitas. 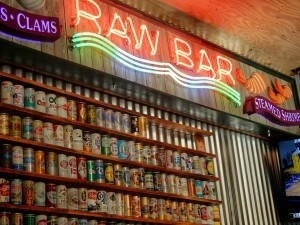 Ocean City Eats! 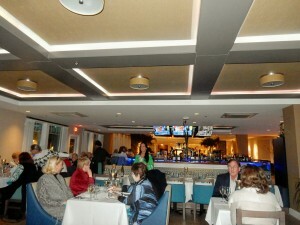 Liquid Assets, Bistro, Bar, Ocean City, Maryland, L.A. On Location, Catering, Best Pan Roasted Mussels Ever!! Opening 2016 with a visit to Liquid Assets in Ocean City, Maryland with my friend, Shelley. Crowded? You bet! It was a beautiful week-end at the Maryland and Delaware Beaches. 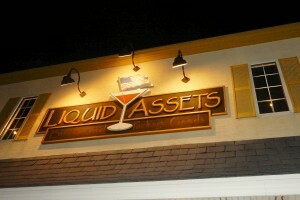 Liquid Assets is located at 9301 Coastal Highway in Ocean City, Maryland. Tel. 410-524-7037. Website? www.ocliquidassets.com. 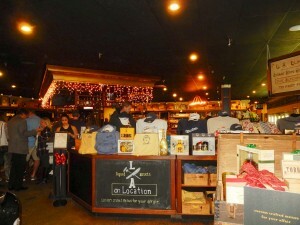 Liquid Assets is a Bar, a Bistro, and a Package Goods Store. They are open every day of the week…Sunday through Thursday from 11:30 a.m. until 11:00 p.m. and Friday and Saturday from 11:30 a.m. to Midnight. Plenty of parking available. 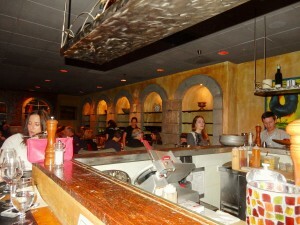 The only seats available were at the Kitchen Bar in the second dining room. This was new for us. We could see some of the preparations going on. I have never sat in this room and to tell you the truth the idea of a kitchen bar is pretty unique just like everything they do. 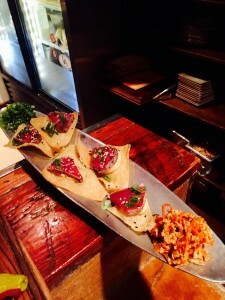 Coming out of this Kitchen Bar were delicious looking Tuna Crisps…rare ahi, crispy wontons, Kimchee, seaweed salad and wasabi cream. 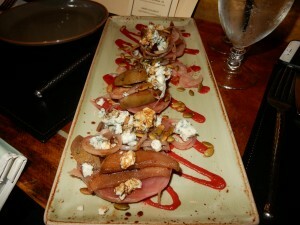 We ordered the Salted Roasted Beets and Caramelized Pear Salad with Point Reyes blue cheese and coriander dusted pepitas. The cheese melted in your mouth and I always order beets when found on the menu. 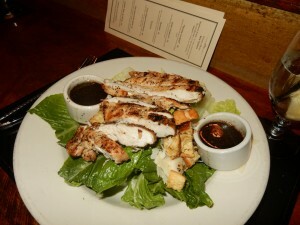 My friend, Shelley, loves their Caesar Salad…but she will deconstruct the salad….Topped with grilled chicken. Knew she was going to have it. Did not even have to look at the menu. From the first time I tasted Liquid Assets’ Pan Roasted Mussels, I have tried them in other restaurants, others states; everywhere. The best EVER are here at Liquid Assets. 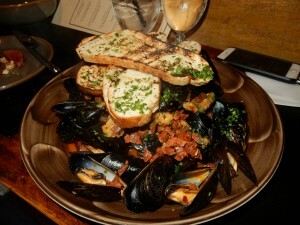 Plenty of mussels with chorizo, shallots, garlic and grilled bread. A spoon will be also given to you because you will not resist the broth. They are truly awesome!! I have them every time. Then an order of their Massaged Kale Salad with Burgarian feta, roasted cauliflower, pickled shallots, Serrano ham crisps, crispy leeks, roasted garlic and lemon vin. 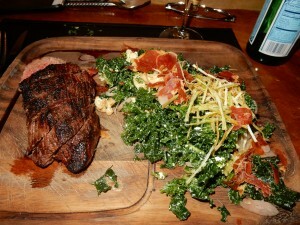 Topped with a Bristro Steak cooked and seasoned to perfection. 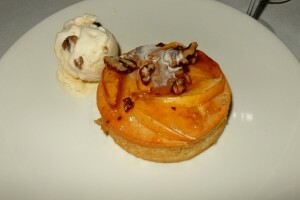 I will have this Sweet Ending one of these days….we looked at it coming out of the Kitchen Bar and it looked soooo good! 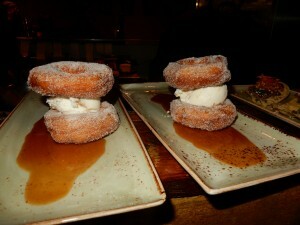 It is their unique Ice Cream Sandwich…House Made Doughnut with God Bless The Queen Chesapeake Bay Farms ice cream, and a bourbon caramel sea salt sauce. Please note that the doughnuts will be warm!! Seriously decadent. 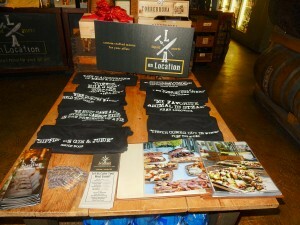 Liquid Assets can custom build menus for your affair, no matter what size. They bring it to your location. And it is not just food. 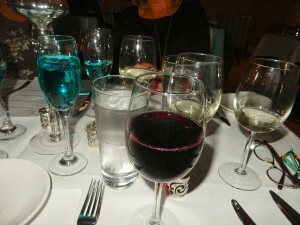 They have professional servers, bartenders, china, silver, linens, tables and chairs. You may call 410-524-7037. Fax number is 410-524-3308. Email contact@ocliquidassets.com. 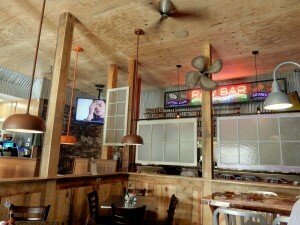 The ride is manageable from the Delaware Beaches so get out and enjoy Liquid Assets for lunch or dinner. 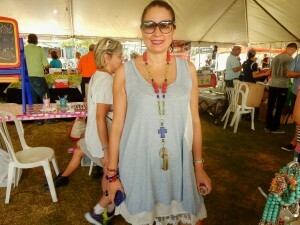 Check out the above mentioned website because throughout the year they have plenty of events. Comments Off on Ocean City Eats! 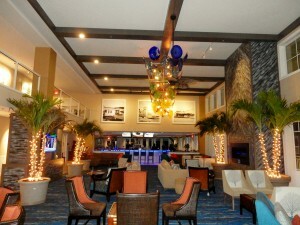 Liquid Assets, Bistro, Bar, Ocean City, Maryland, L.A. On Location, Catering, Best Pan Roasted Mussels Ever!! Destination? 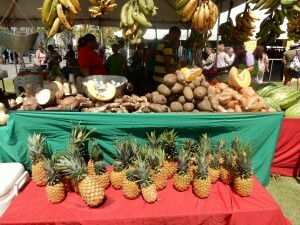 Condado, Puerto Rico, Mercado Urbano (Farmers Market), Ventana al Mar, San Juan, Buy Local, The Caribbean, La Isla del Encanto, First Urban Market of 2016!! We really should not complain here in Southern Delaware. The temperatures so far have been great and it has felt like summer all through the Holidays. But, as we start a new year, and being that it is January, the temperatures dipped a bit this a.m. 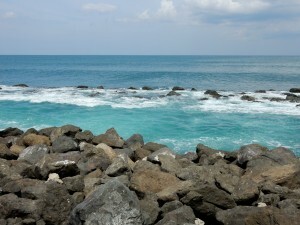 Thinking about the blue waters of San Juan. Getting to Puerto Rico is pretty easy. It is a relatively short flight and there are daily flights from Baltimore (BWI) and Philly. 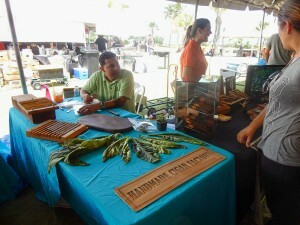 Every first Sunday of the month the Mercado Urbano or Farmers Market takes place at 1054 Ashford Avenue…9 a.m. until 5 p.m. It is a great way to get up close and personal with farmers, and artists. 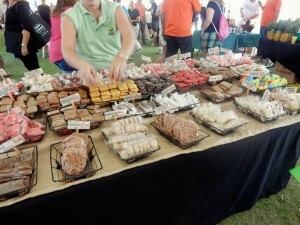 It is a family affair with plenty of food for everyone. This will be the first Mercado Urbano of 2016!! 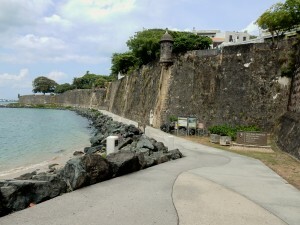 This time of the year in San Juan the temperatures will be in the low 8Os, which is great for walking and exploring the Condado area. 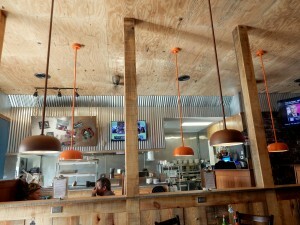 Mercado Urbano is also ocean front. 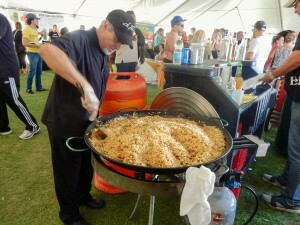 Every Sunday there will be paella. Local cookies…bring back childhood memories. 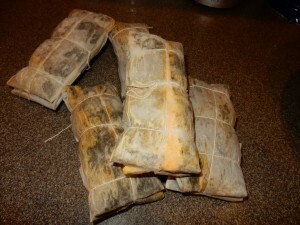 Cod Fish Cakes or Bacalaitos. They are so good, and yes they are fattening. Throughout the day there are plenty of activities. On Sunday, December 3rd from 9 a.m. until 10 a.m. Yoga with Lara. All you have to do is bring your mat. 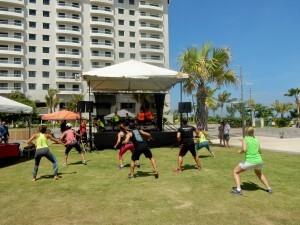 From 10 a.m. unti Noon you can participate in Boot Camp with Spartan Fit. From 3 p.m. until 5 p.m. there will be live entertainment on the stage. 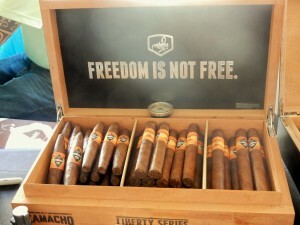 Shop around for Puerto Rican cigars. 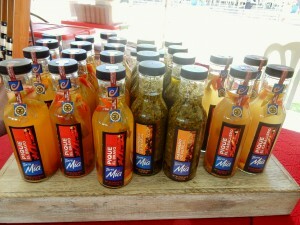 Every household in Puerto Rico has “pique” or hot sauce, locally made. 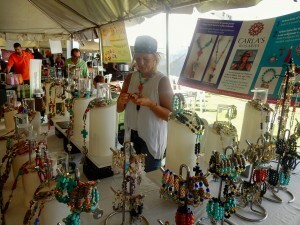 And please stop by to meet Carla from Carla’s Rosaries. 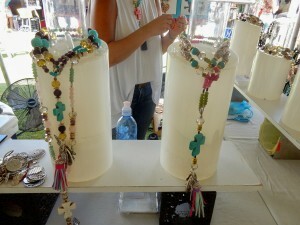 All made by Carla…they are beautiful. Check her out on Facebook. 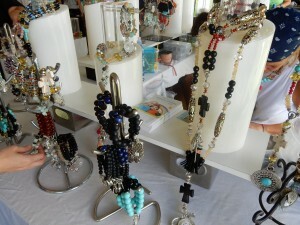 Her website is http://www.carlasrosaries.com. This customer was so graciously posed for a photo. 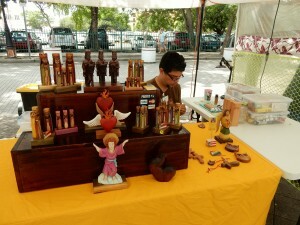 If you are in the metropolitan area of San Juan, please stop by. It is a lot of fun!! Comments Off on Destination? 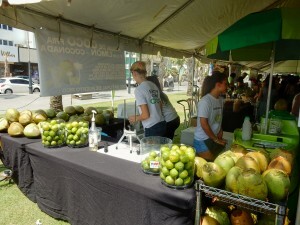 Condado, Puerto Rico, Mercado Urbano (Farmers Market), Ventana al Mar, San Juan, Buy Local, The Caribbean, La Isla del Encanto, First Urban Market of 2016! !